Gouaches were not the only art medium which came with me in my suitcase to the French Riviera. Anticipating the ripening of artistic inspiration as soon as I entered the artists’ favourite haunt of St-Paul de Vence, I ensured that I always had a sketchbook to hand. 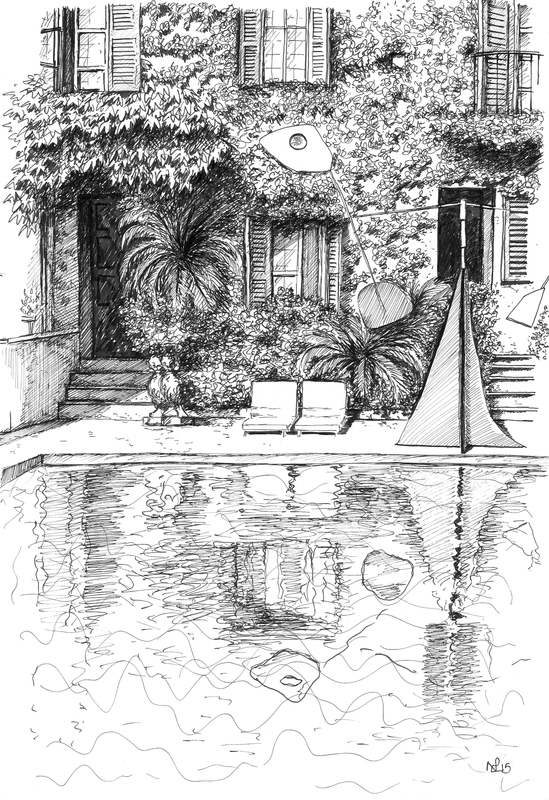 And it was within the first 24 hours that I opened that very same sketchbook, as we once again settled next to the pool of the La Colombe d’Or hotel. With Alexander Calder’s amazing mobile swinging idly just before me, and with the old hotel building ahead bursting with its cover of foliage, I could not resist this beautiful view, and set to work. And here is the result… all conceived in my trusty Staedtler pens. Who needs a pencil?